Our Clover Murphy Cabinet Bed is a truly instant guest bed. 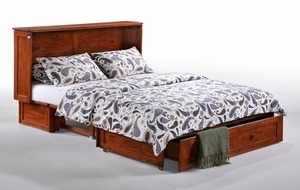 Convert it from handsome cabinet to comfy queen size bed in less than a minute. When all closed up it just takes 10 square feet of floor space. Shown above in Cherry finish, also available in Dark Chocolate and White finishes. This item can't be shipped via economy ground due to size restrictions. Please choose the Freight shipping method upon checkout. Ordering multiple items will reduce your per unit freight cost. Ships to 48 states directly from the manufacturer via LTL Freight. Most orders ship out within 2 Business Days. The freight carrier will contact you to make a delivery appointment. Residential LTL deliveries are "Curbside Delivery" and include a lift gate on the back of the truck to allow heavy items to be unloaded at ground level. You are required to meet the delivery truck in front of the house, the driver will unload the item(s), but the customer is responsible for carrying item(s) into the house. Please arrange for help to bring heavy items inside. It�s possible you may be able to arrange additional delivery services with your carrier, for an additional charge, at the time they contact you to set the date and time. IMPORTANT: On arrival, inspect the shipment immediately for obvious signs of damage and note any damage on the Bill Of Lading before signing. The Clover Murphy Cabinet Bed comes width a limited 10 year warranty. The supplied mattress is covered by a limited 3 year warranty. The warranty applies only to the original purchaser and does not cover: (a) wear and tear; (b) damage caused by abuse or failure to follow care instructions.